First in a series of articles on how RDECOM is supporting the Army’s six modernization priorities. To prepare for the battlefield of the future, the U.S. Army must be ready to fight in a very different operational environment from any wars previously fought. The character of war has changed significantly, and the Army, along with its joint service partners, must be ready to deploy and fight in a high-intensity environment where all domains will be challenged. To rebuild readiness and modernize the force, the Army has refocused on six modernization priorities: long-range precision fires (LRPF), Next Generation Combat Vehicle, Future Vertical Lift, the network, air and missile defense and Soldier lethality. In response to the Army’s shift, the U.S. Army Research, Development and Engineering Command (RDECOM) reviewed previously approved funding strategies and shifted emphasis from planned and ongoing work to focus on the new modernization priorities. While RDECOM’s Armaments Center leads the LRPF modernization effort, the nature of the threat, the technologies and the environment of future battlefields dictate that only a truly integrated approach will meet the Army’s requirements. Our six research, development and engineering centers and the U.S. Army Research Laboratory, RDECOM’s corporate lab, are working together, along with domestic and international academic and industry partners. The centers and lab also work closely with the eight cross-functional teams to develop a concept of operations and provide support in technical analysis, portfolio alignment, proposal and program briefings and coordinated modernization strategy development, as RDECOM plans its announced move from the U.S. Army Materiel Command to the Army Futures Command (AFC). 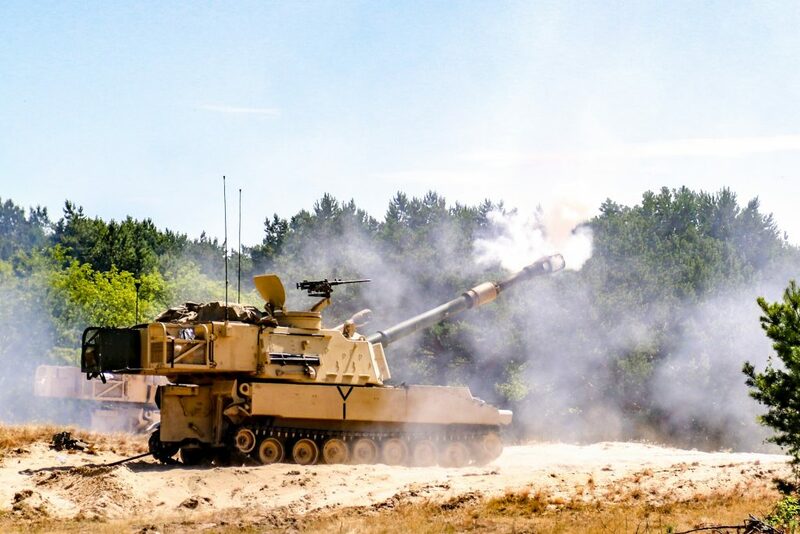 An M109A6 Paladin belonging to the 1st Battalion 82nd Field Artillery Regiment conducts a t fire mission in Torun, Poland while conducting Battery qualifications. The Battalion is part of the 1st Armored Brigade Combat Team, 1st Cavalry Division training in support of Atlantic Resolve. A number of potential adversaries have missile systems that exceed the range of the Army’s currently fielded systems, so the Army has identified LRPF as its No. 1 modernization priority. This effort includes new artillery weapons—missiles, howitzers, shells and rockets—that are more precise and more lethal over a longer range. These new systems must have the capability to target and destroy or degrade the enemy’s anti-access and area denial (A2AD) systems to enable the joint force’s freedom of maneuver and action. 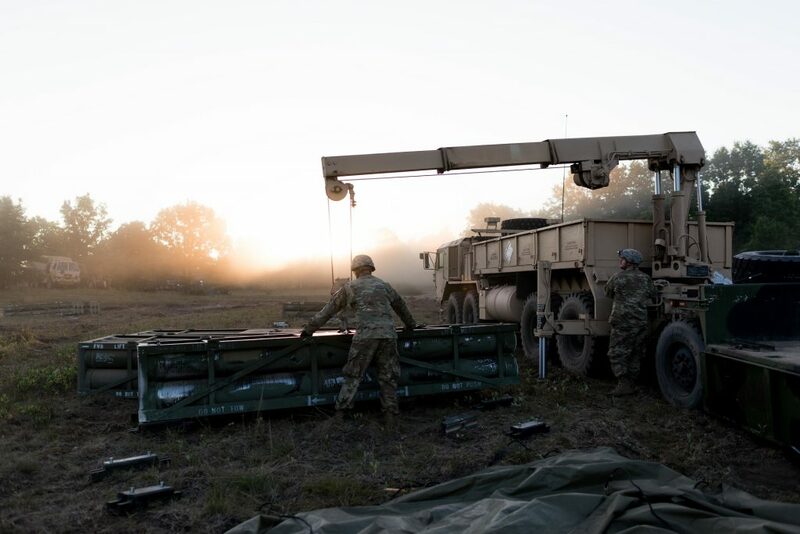 This makes LRPF an excellent example of RDECOM’s threat-informed development, as well as an early test of the command’s ability to supply overmatch capabilities for Soldiers fighting on an as-yet-undefined multidomain operations battlefield. To extend the range and destructive power of Army weapon systems, the RDECOM Aviation and Missile Center is working on the LRPF family of technologies, which will replace the Army Tactical Missile System that has been fielded for 35 years. The Precision Strike Missile is slated to replace the obsolete Army Tactical Missile System in 2023, with extended range (out to 499 km), along with improved GPS jamming resistance, increased rate of fire from one to two missiles per pod and lower cost per missile. 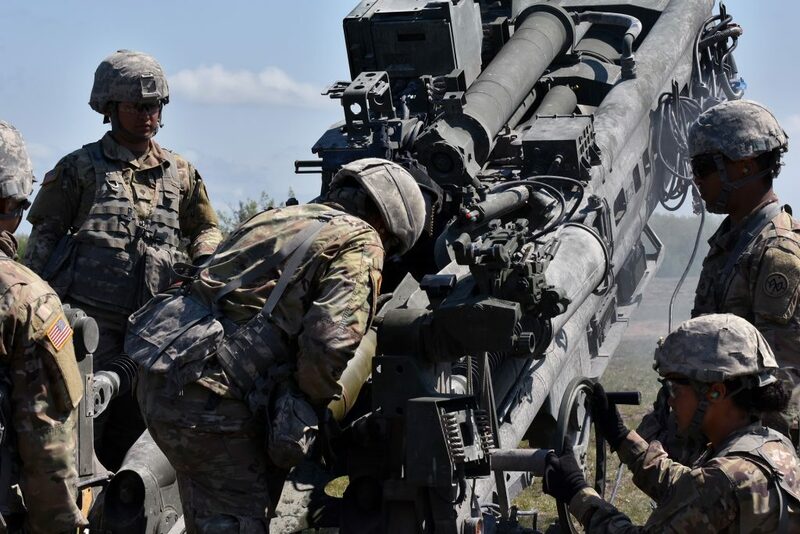 While the Army has fielded the Paladin howitzer for more than 25 years with only minor improvements, a new system has been developed to meet the needs of the current force. The updated Paladin Integrated Management System is much faster than its predecessor, enabling it to keep pace with the maneuver formations that it was designed to support. The range of the new Paladin self-propelled howitzer will increase from 22 km with standard rounds to 30 km with rocket-assisted projectiles. Soldiers from the 1st Battalion, 5th Artillery at Fort Riley, Kansas, tested the system earlier this year, driving the vehicle more than 60 miles per day while firing more than 100 projectiles daily. While the state-of-the-art howitzer addresses critical issues of its earlier variants, a next-generation Extended Range Cannon Artillery (ERCA) prototype is being developed for fielding in 2025. The ERCA consists of two parts—a new rocket-boosted shell, the XM1113, and a longer howitzer barrel. The XM1113, which has a current range of 30 km when fired from the Paladin, was tested at Yuma Proving Ground in Arizona in April this year. The prototype was tested using the currently fielded Precision Guidance Kit, which is a fuze that turns a conventional artillery round into a semiguided one. During testing, the XM1113 projectile exceeded 60 km; the Army is working toward fielding systems that are capable of accurately striking targets 100 km away. The advanced hypersonic cannon shells that will reach 100 km will provide lethal options for commanders and reduce the need to shoot rockets that cost substantially more. In addition to longer range, ERCA will have a longer cannon rifle tube, a fully automated ammunition loading system and a communications system that will work in GPS-denied environments. RDECOM’s Ground Vehicle Center is developing high-voltage components that will give the ERCA system more power to maintain overmatch against evolving threats. For example, by replacing a four-channel distribution box with a 12-channel high-voltage power controller, ERCA will not only have significantly more capability, but also improved reliability and safety. These changes will enable the system to distribute all of the electrical power that it can generate without negatively impacting space and weight. In multidomain operations, the Army anticipates that Soldiers will be attacked from land, sea, air, cyber and space, and they will need to perform a variety of missions quickly. Soldiers will not only need the most advanced weapons available, but they also will need to know which weapons will be most effective in different scenarios. While a weapon directed at a single target may result in destroying the target, other situations may require delivering artillery shells that amass over an area, loitering until needed. The U.S. Army Research Laboratory (ARL) is developing technologies to support collaborative weapons that are interconnected, precise and smart. By sharing sensing, computing and navigating capabilities using a network of sensors, these weapons will send information back to the warfighter, including situational awareness to make informed decisions. These future collaborative weapons will need to create physical damage, as well as nonkinetic effects to jam communications systems, disturb sensors and stop electronics. To give Soldiers the flexibility, technical expertise and maneuverability to survive in multidomain operations, these collaborative weapons will need to deploy in both mounted and dismounted variants. ARL scientists are also looking at ways to develop weapons that will accelerate from subsonic to supersonic speeds and morph into different shapes to adapt to emerging conditions, using information gathered from the enemy. In addition to working with hundreds of domestic and international industry and academia partners, RDECOM collaborates with other Army organizations, DOD laboratories and joint services to develop and test science and technology (S&T) efforts. The command shares information and discusses collaboration opportunities with Navy and Air Force counterparts during quarterly DOD lab sync meetings that each service hosts on a rotating basis. 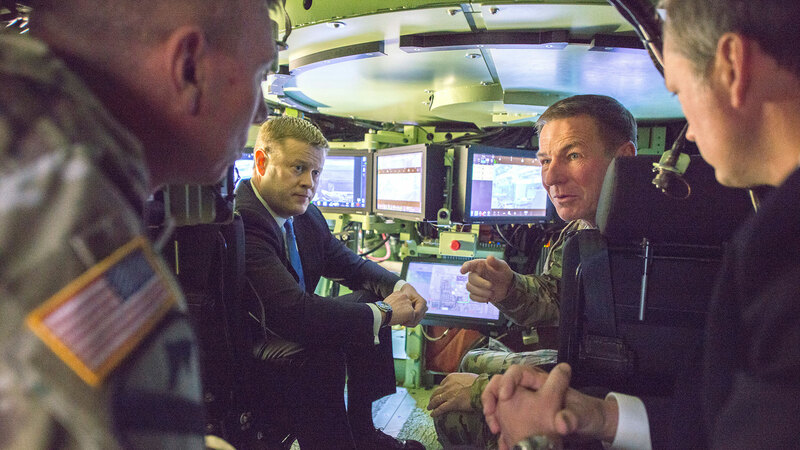 Working with the joint services provides opportunities to leverage technologies and capabilities across the DOD enterprise and reduces the risk of researching and developing the same or similar technologies. In developing the approach for the Land Based Anti-Ship Missile Program, RDECOM’s Armaments Center is working with the Navy to leverage its expertise in maritime targets. The Army has not studied the unique challenges of finding and attacking ships since it disbanded the Coastal Defense Artillery in the 1950s. The Army has the capability now to destroy targets from land to land and from land to air using long-range missiles, but multidomain operations will require additional flexibility for the weapons to operate in the maritime domain. The Land Based Anti-Ship Missile Program reflects a fundamental change in field artillery rockets and missiles. For the first time, the Army will have tactical missiles with seekers to precisely hit moved, moving or poorly located targets in an A2AD environment. (Poorly located targets are targets for which we lack precise information on where they are located—we may have had the precise location, but the target moved, for example.) These missiles will have significant impact on joint operations, including the Air Force and Navy, by giving them opportunities to conduct air and sea operations that may have been previously difficult or impossible to execute. RDECOM will continue to work with experts from the Navy to understand the problems that exist and work possible solutions. The Army is also looking at best-of-breed technologies from all of the services, including the Air Force’s work in hypersonics. The Air Force is developing novel concepts for airframes and propulsion that could be applicable for any Army mission that may require hypersonic munitions. These munitions will be more advanced and smaller, enabling aircraft to carry more munitions without adding weight or sacrificing firepower. The Army Futures Command’s cross-functional teams have representatives from different functions and communities of expertise across the Army, including members of the S&T, materiel, acquisition, test, cost and estimate, contracting, analysis, capability and requirements, funding, intelligence and public affairs communities. The Long-Range Precision Fires Cross-Functional Team, located at Fort Sill, Oklahoma, has two RDECOM employees dedicated to supporting the LRPF modernization priority, with reachback to two dozen RDECOM employees for support at any time. The LRPF Cross-Functional Team leveraged the Aviation and Missile Center’s S&T road map for missile investment as the basis for its deep strike missiles future plan. As long-range precision fires is an integrated system of systems that supports and enables capabilities for aviation, missile defense, armaments and tank, automotive and Soldier systems, the LRPF Cross-Functional team works closely with other cross-functional teams through working groups. These working groups analyze modernization dependencies to ensure that capabilities and technologies align with portfolio investments. The driving mission of the LRPF Cross-Functional Team is to enable technologies for cannons, munitions, rockets and missiles with enhanced precision and lethality effects at extended ranges in degraded A2AD operational environments. The team’s near-term goals are to develop cohesive modernization road maps to deliver technology for long-range precision fires and maintain Army S&T portfolio investments to support current and future overmatch capability gaps. 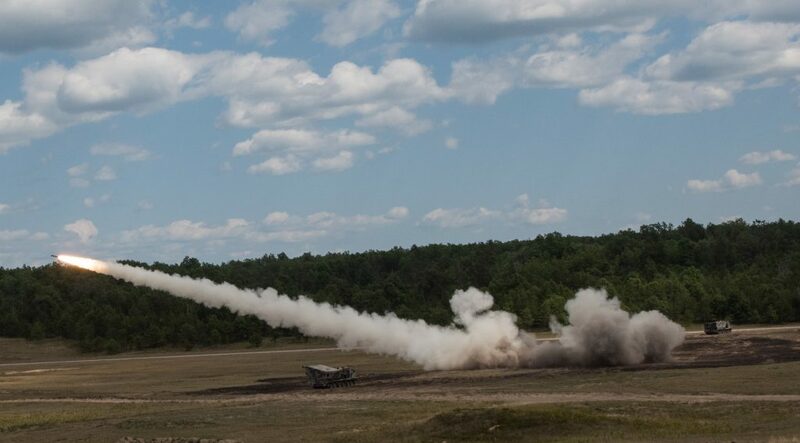 In looking to support the future of the Army, RDECOM is planning technology demonstrations with cannons, munitions, rockets and missiles with various ranges. Demonstrations began in May 2018 and are scheduled to continue over the next several years as the technologies transition to programs of record, which are fully funded, or become directed requirements, which are expedited requirements to fill an urgent need. As RDECOM transitions into the new Army Futures Command, it will continue to support the modernization effort by working on projects with internal and external partners to sharpen the Army’s competitive advantage. Leveraging the Army’s modernization strategy to fail early and fail cheaply, the centers and labs promote continuous experimentation and prototyping that reduces risk, demonstrates technical maturity and evaluates technical solutions to inform requirements for near- and far-term capabilities. RDECOM uses the lessons learned from experimentation and prototyping to refine technology for capabilities that the warfighter will need to fight and win in multidomain operations. It has long shared those lessons learned with the Army Capabilities Integration Center and other partners. The command is now deeply involved in helping the Army design the new Army Futures Command to maximize its core competencies while achieving the greatest possible synergy with its new partners in that command. For more information, go to http://www.rdecom.army.mil/ or contact RDECOM Public Affairs at 443-395-3922.